You can trim out parts of any video using the Editor. The Trimming tool allows you to edit your videos by setting new start and end times for your media. Note: Trimming changes the original file, and the change cannot be reversed. In My Media, click on the entry you want to trim. Click the Actions menu and click Launch Editor. Click and drag the yellow handles on the timeline (bottom of screen) to move the markers to new start and/or end times. Click Save. The newly-trimmed video will appear in your My Media. In MediaSpace, you can create clips from existing videos; each clip becomes its own new media entry. The clipping tool enables you to edit your videos by setting the start time and end time of your clip. Click Save a Copy. The new clip will appear in your My Media. Chapters are like bookmarks, which can be used to navigate through a video. You can use chapters to mark the beginning of a new topic, highlight important segments, or help navigate through a longer video. 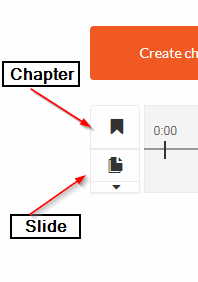 You can add, edit and delete chapters and slides in the Timeline tab under Edit in your My Media. A Slide is a visual element synchronized to the main media. Slides can be viewed inside the player, simultaneously with the media. 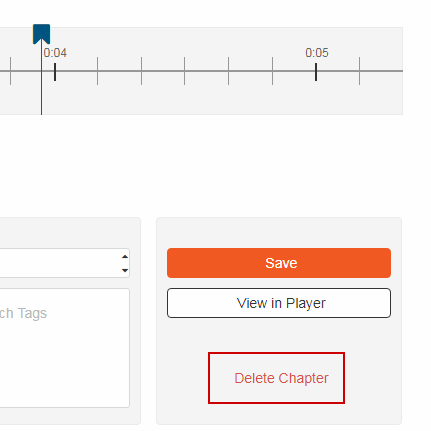 After Chapters and Slides are created, the player will display the Navigation Panel: a list of chapters and slides available alongside the main video content. Go to your My Media page and click Edit near the entry you want to edit. Place the cursor on the timeline and click the Create Chapter icon to create or update a chapter, or click on the cue point for the chapter you want to edit to view its properties. Select the Timeline tab. Here, you can view all the chapters and slides in the video. Click on the cue point of the chapter you want to delete from the video. A confirmation box will appear: click Delete to confirm. In My Media, click Edit next to the entry you want to edit. Click to place the cursor on the timeline and click the Create a new slide button to add a slide, or click on the cue point for the slide you want to edit to view its properties. Click on the cue point of the slide you want to delete. A confirmation box will appear. Click Delete to confirm. In Kaltura, you can replace media and retain the entry’s data, URL and other settings. The time-based metadata (like chapters and slides) will remain, though after replacement it will probably be out of sync and will need to be adjusted. In My Media, click Edit next to the entry you want to replace. In Edit Media, select the Replace Video tab. Select Upload from Desktop. Locate the file on your hard drive and select it. After the upload is complete, click either Approve, to replace the video, or Cancel Replacement to cancel. Locate the video in My Media and click on Edit. Click Delete Media to delete the entry. The Kaltura platform offers the option of adding captions to any video you upload. Adding captions to videos makes them more accessible to various groups, including deaf/Deaf/hard-of-hearing people, people with sensory processing disorders, and people for whom English is a second language. Adding captions to Kaltura videos is a 2-step process. First, you must create the caption file. Kaltura is compatible with SRT and DXFP formats. There are several ways of creating caption files. You can create the file manually and attach it to the video. Some tools allow you to upload an existing transcript of the dialogue in the video and create the captions from that. Still other tools (like YouTube or Camtasia) allow you to upload a video and then use audio-to-text transcription to create captions that you then edit for accuracy. At present, Kaltura has no built-in tool for creating captions, so some other options are listed below. You will need a YouTube account to use the YouTube captioning tool. Upload the video to YouTube (we recommend uploading it as Unlisted). Once the video has been uploaded, find it in the Video Manager and select the video’s Edit button. You may see a pop-up asking you to Set video language. 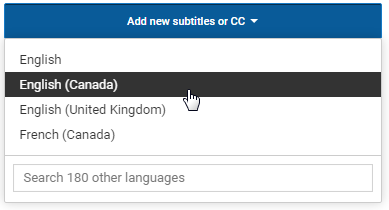 Select the language most often spoken in the video and click Set language. YouTube will attempt to automatically caption the video, but this does not always work. Select the English (Automatic) option to start the process. Click on Edit above the Captions. Read through the entire set of captions to fix incorrect captions, wrong words, unneeded captions, spelling mistakes, and to adjust timings. Refer to YouTube’s official “Add subtitles & closed captions” support page for more details. Once your captions are correct, open the Actions menu and select .srt. The caption file will download to your computer. This method allows you to bypass YouTube’s auto-captioning tools and manually upload a written transcript that you previously created. This file should be in plain text format (.txt). This file type can be created in programs like Notepad or TextEdit. In the Subtitles and CC area of the Video Manager, select Add new subtitles or CC. Select English (or the language that will be used). Click Transcript. Click Choose File and locate the transcript file on your computer. Click Upload. Once the file has uploaded, click Set Timing. YouTube will begin processing the uploaded transcript and attempt to sync it to the video. When processing is done, open the captions, check that the transcript has synced correctly, and make any necessary adjustments. Download the completed caption file as above. In Kaltura, you can add multiple caption files to a video from the Edit view on any video available to you in My Media. You can add multiple caption files, and captions will be searchable along with Title and tags. Click Edit next to the video you want to add captions to. 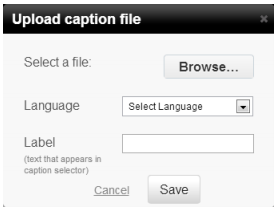 Enter a label to display for the file in the caption selector (usually the language of the captions, e.g. “English”). This is what will appear in the Captions menu on the video player. Above the video, click on its title to leave Edit mode and view the media. The caption will now appear in the video’s Captions menu.